For publishing, 2009 may go down as the year of the machine. Consider Amazon’s electronic-book reader, Kindle. Though the first version launched in late 2007, a lighter, faster, cheaper version went on sale this spring. And while the online-only retailer doesn’t release sales figures for the reader itself, its cultural impact was clear by late July, when USA Today announced it would include Kindle editions in its popular weekly list of best-selling books. With slightly less fanfare, 2009 has also seen the emergence of the Espresso book machine, which will make its New York bookstore debut this fall, having already popped up on campuses in several states. Where Kindle offers consumers a chance to buy some 350,000 books at the touch of a finger — and then read them electronically — the Espresso allows them to print a professional-looking paperback book in about the time it takes to drink a cup of coffee. At first glance, the machines are diametrical opposites — physically, economically and philosophically. The smallest Kindle weighs 10.2 ounces. The Espresso weighs in at about 800 pounds. The cheapest Kindle costs $299. The cheapest Espresso, produced by On Demand Books of New York, goes for at least $75,000. 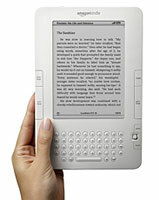 The Kindle is all about virtual books and online transactions. The Espresso is about physical objects that consumers buy in person. Yet Wharton faculty who follow the complicated, emotionally fraught subject of how we buy and sell literature say the two devices share something even more important: A role in upending longstanding customs in the slow-to-change business of publishing. In an industry where inventory problems and overprinting of books is a perennial money drain, the Espresso’s premise — not paying production costs until a reader buys a copy — is a revolution. And in a business where the cumbersome task of routing books to your local bookstore has been a continuing burden — not to mention a risk, since the book may be sitting on the shelf for years — the idea of cutting out the supply chain represents a major development. The book business has always been more important for culture than for the economy. All the same, moving beyond five centuries of Gutenberg-style production raises questions about how consumers determine value, what they want to read and even how much shelf-space home-builders should design for the living rooms of tomorrow. But just how long a time is open to debate. “There are real generational differences,” says Wharton marketing professor Patti Williams, who studies the role of emotions in decision making. The rapid decline of news media brands, for instance, suggests consumers of other forms of media have been able to move beyond long-established hierarchies. “Look at what’s happening to readership of newspapers and magazines,” she says. Many of those readers are turning to blogs, and in doing so they are saying that they do not “rely on some third party to validate” everything that they choose to read. Indeed, the rise of Amazon as a vendor of actual, physical books has already slashed the authority of those publishers who could afford to get their titles into distant bookstores: Online, it’s as easy to buy an obscure tome from a small imprint as it is to buy the latest major-publisher blockbuster. As a result, consumers can navigate not just the annual offerings of the big firms, but the entire list of extant titles — the so-called “long-tail effect,” a term derived from the shape of a graph of long-term book sales. Back when bookselling was the province of comparatively small local stores, the season’s big sellers represented a hefty portion of total sales. Thanks to the Internet’s ability to supply massive variety to consumers, today’s market sells many more titles, but fewer copies of each one. Nonetheless, Fader believes Amazon won’t regret its investment. “The business model, what Amazon has done, is brilliant,” he says. “The millions they will lose on the Kindle will be offset by the millions they will make on the subscription service.” Money-losing illegal downloads preceded the idea of paying for electronic versions of music. But the machines of 2009 have ensured that the idea of shelling out money in exchange for non-traditional versions of a book has taken hold without competition from free, illegal versions.